You must ask for permission before using this script in a performance by contacting doug@freedrama.net (please include the title of this monologue in your request). Two people are in a mall selling products. The man named Carl is in a fat bird costume selling some kind of candy. 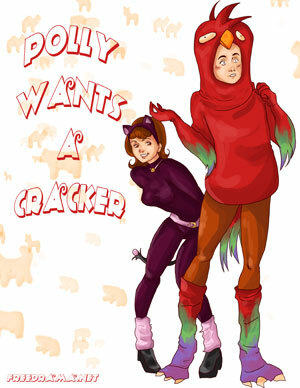 The woman named Polly is in an animal costume selling animal crackers. The bird man keeps checking out the animal woman but not so bad that she doesn't seem to notice... but eventually she does. She goes up to him. I have to say... that costume is really cute. I love chunky birds... I just want to squeeze them. She gets embarrassed and goes back to her animal cracker sale table. He mumbles under his breath. You can squeeze me if you want. He is startled and turns away. She looks kind of sad and turns away. He decides to talk to her some more. She is happy he is talking to her again. Oh, I love animal crackers. He tries to get to his wallet but can't because of the bird costume. Yeah... oh crap, I don't think I can reach my wallet. She reach in back and someone walks by and stops... stares. She gets mad at the person who is staring at them. Yup... so you're not fat? No... I like fat birds, not fat guys. She closes his bird mouth over his face. She lets go. He is confused. Nothing. So you want one box or two... of animal crackers? How much money do I have in my wallet? A lot... you rich or something? Then all that money is stolen. I don't like thieves either. Stolen but I recovered it from the thieves and I'm returning it to the rightful owner. There you go! I knew you were a good simple honest... bird. Those crackers look good... wish I could eat some now. These bird hands are a pain. I try to eat and the wing smacks me in the face. He demonstrates and she laughs. I can feed them to you. He gets all embarrassed at her offer. Really? You mean with your hands... in my mouth. She feeds him. He gets a very funny look on his face. She puts it back and checks out his rear. She feeds him again and he flaps his wings happily. I like to bite off their heads. Am I sick? Good... only one box left to sell. She looks in sales box. Person comes back to buy the Bird's last box. He hides his box. That's what I was afraid of. Tons left. I'll be here forever. I think my costume is scaring people away. I wish I had a cute birdie costume like you. I wanna squeeze you so bad. She rushes up and grabs him and gives him a huge hug. She squeals in delight. Bird is in a happy daze. Good birdie... here's a cracker... you really like it when I feed you don't you? So what you doing after work? Dinner maybe... you wanna come feed me some more? I'll go to dinner with you. But you don't even know exactly what I look like... I look like some guy who is getting barfed by a bird. That's even worse. And you still like me? That picture is terrible. Well, if you look better than that picture, we're in business. So if you sell the rest of those crackers, you can go to dinner? Yes, but that might take forever. I think I'd like to buy some more crackers. I thought you stole that money. No, I'm a superhero who recovered the stolen cash. When danger lurks, give them the bird! Nice... you need your own comic book. So how about it? Sell me those crackers? I really want to take you to dinner. They walk out together happily.